Launch: Various sites, including Bellingham, Cornet Bay, Twin Bridges and Anacortes Marina . 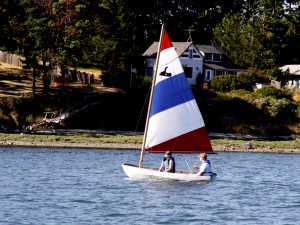 Comments: The Lopez Island 4th of July celebration at Fisherman's Bay is famous among San Juan Island folk. CThe San Juan Islands, of Washington State, are some of the finest cruising grounds on Earth. A myriad of fascinating islands to explore. Many coves for anchoring and ample marinas for supplies and for mooring for those who prefer a tie to land. State and National Park and Wildlife areas, preserving natural settings and historical sites. Interesting walks through wild beauty or small towns. Sure, there are other areas that might offer some of these choices, but we have been here for more than a month this year and have hardly scratched the surface of what these islands have to offer. 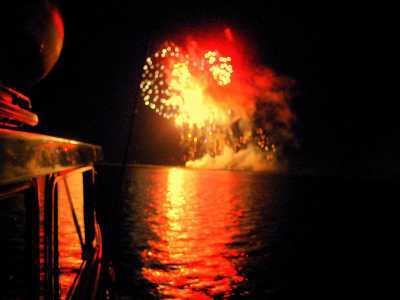 CAnd here's a major bonus: this year, we have been to fireworks displays on three different islands. The Fourth of July is such a special day to Americans. 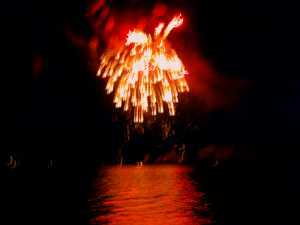 It commemorates the birthday of our country. It recognizes the bravery of those who came before and were willing to sacrifice everything for a new idea - a new way for people to govern themselves. For all of us, today, it recalls memories of family times with firecrackers and parades. 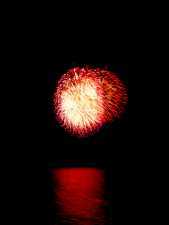 We remember our experiences as children standing in awe of the nighttime ritual of fireworks displays. And, for us older folks, holding hands (or ears) of our children and (for some) our grandchildren. It is a special day and night of celebration. CWhat about those of us who live on a boat? Do we miss out on some of this fun? 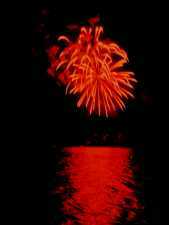 Last year, with a son and grandson, we celebrated the Fourth in Wrangell, Alaska, and it was great! 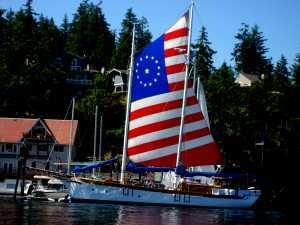 This year, with a view from on the water, we returned for our second 4th of July at Fisherman's Bay on Lopez Island in the San Juans. What a delight to add this special night (or week if you care to visit Lopez for a week of art and food). 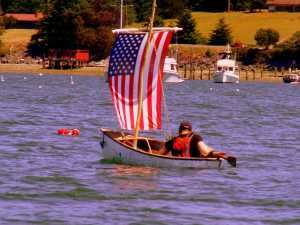 CHere are a few scenes from the Fourth of July in the San Juan Islands.